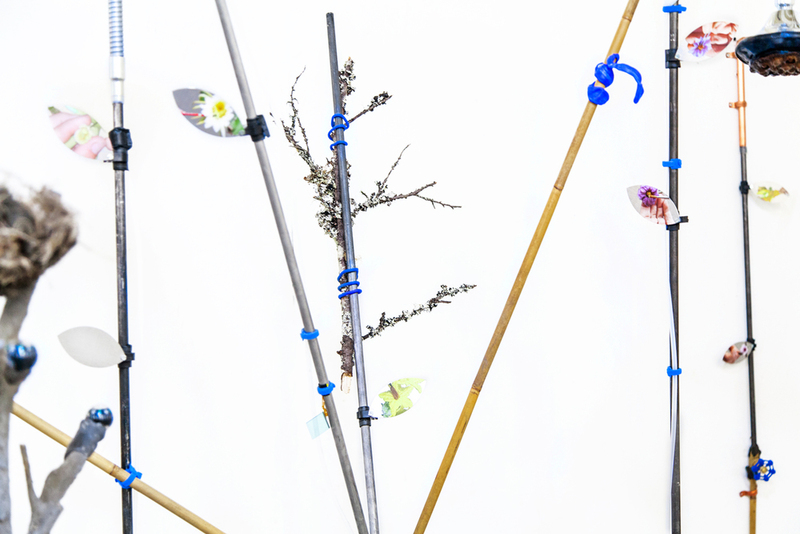 Carson Fisk-Vittori, detail from Weather pollination techniques: out of human visible range (2016); 78 x 36 x 36 inches; UV prints on aluminum, aluminum poles, bamboo, hand-formed plastic, lichen covered branch, lotus seed pod, digital camera, flexible tripod, negative ion showerhead, metal and plastic hardware and fixtures, velcro, water. Courtesy the artist. CUE Art Foundation is pleased to announce Radical Plastic, a group exhibition featuring artists who employ formal visual languages to address more human contexts including the problematics of bodies and gender-based constructs. 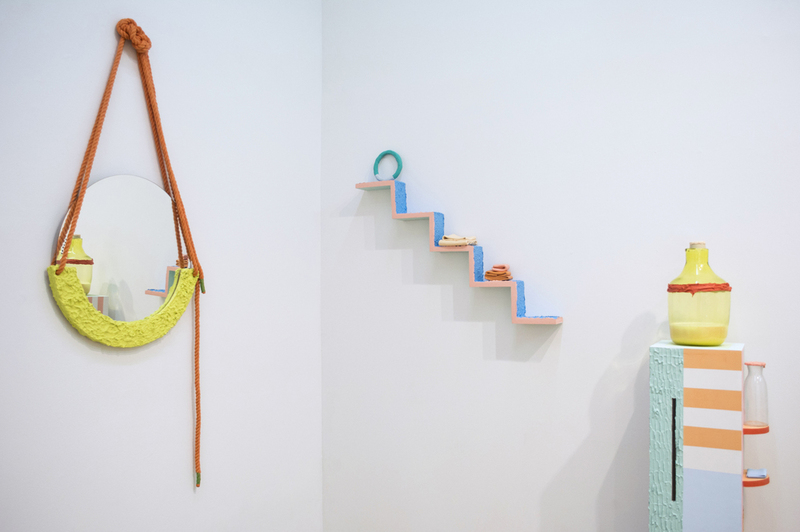 Radical Plastic is an opportunity to mediate on the idea of in-between-ness, and what it means to be in the middle of something as each artist proves adept at navigating fluid and liminal areas. 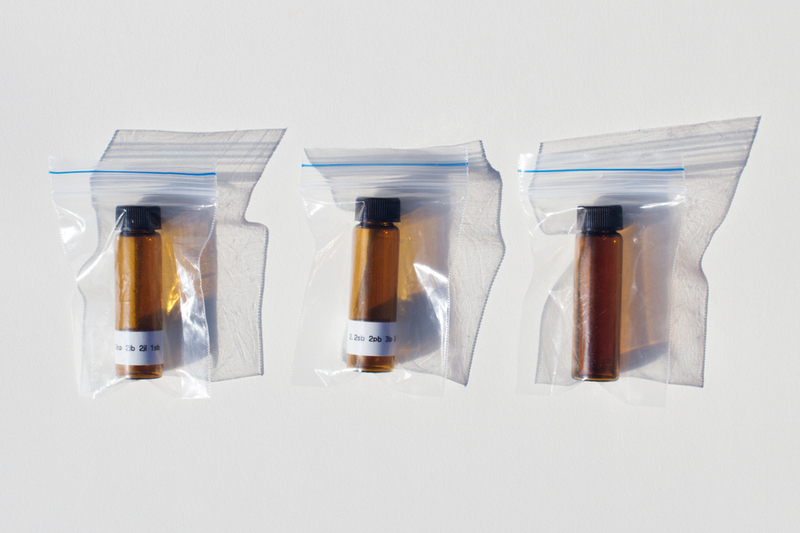 Becca Albee’s work navigates between prescriptions of color as relating to the body, gender, and space, and looking at color theory as a lens to confuse those constructs. On view is Albee’s Radical Feminist Therapy series, which looks at Bonnie Burstow's Radical Feminist Therapy: Working in the Context of Violence (published in 1992) as point of departure. Carolyn Carr’s A Photographer’s Studio and the Problems of Posing, takes its title from a William Mortensen book and utilizes a store-bought drop cloth painted with red clay sourced from the Antebellum Trail as conceptual and literal backdrop for her photography studio room installation. Catherine Czacki’s sculptural work, BB, is an anti-bed bug mattress cover re-imagined as a slumping, hanging sculpture—prompting connotations to porousness, desire, possession, the still life and the establishing of physical boundaries between self and other. Rachel Debuque creates large scale, candy colored sets that both challenge and reflect pop cultural tedium. Within her sets, constructed objects act as molded simulacra, which offer an opportunity to give them new meaning. Glisten, a new work commissioned by CUE, is a performance installation that features a muscular, female athlete in an “exercise room,” who is performing a workout regime. Carson Fisk-Vittori constructs environments integrating images, artifacts and flora to analyze the complex interactions between humans, the dynamic landscape and its ecosystems. 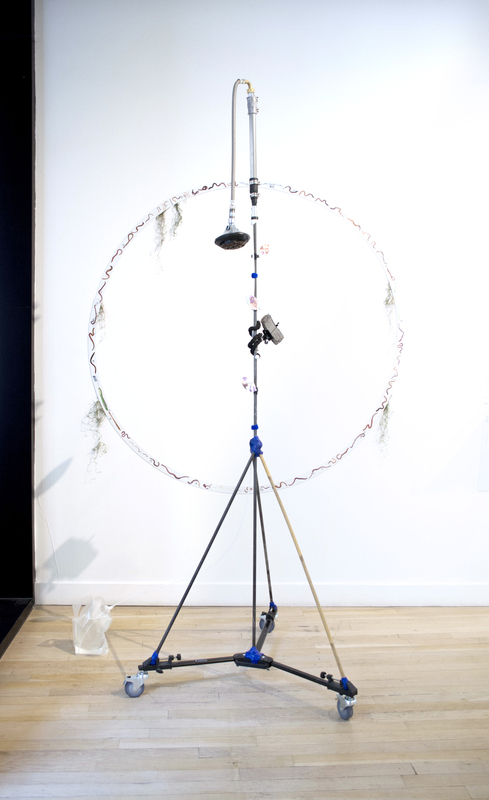 Her current body of work, Disturbance Ecology, brings together an ecosystem of hypothetical weather machines, landscaping scenarios, and animal repellants. Mia Goyette's work explores a potential future by creating a “hybrid landscape” from the detritus of human consumption. Wall-mounted sculptures dramatize and exaggerate waste streams created by simple domestic systems such as decorative window box flowers and their contained water run-off trays. Michelle Grabner is driven by a consistent negotiation with the forms that qualify "domesticity" through her "home base." 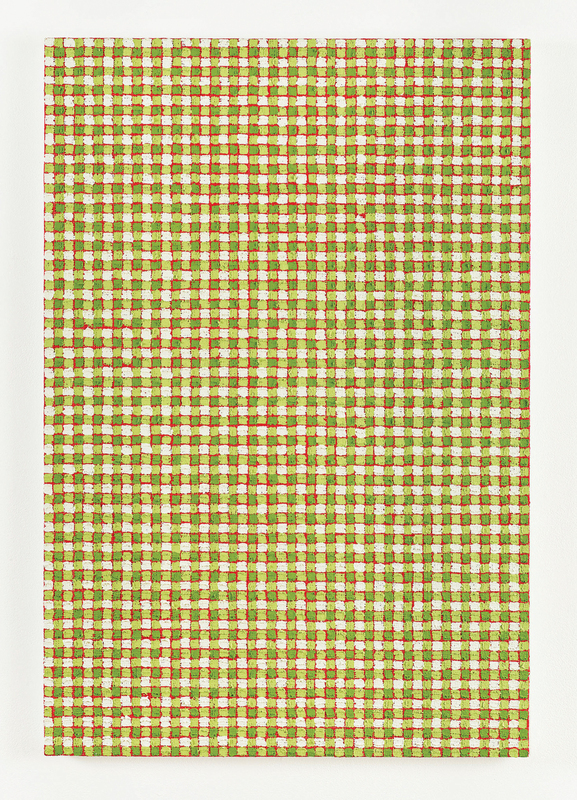 On view are a selection of her gingham inkjet prints, works that reinforce her long-form practice of copying and translating gingham patterns uniting the body (hand) with the mind (commentary) in an almost coach-and-player like fashion. Ria Roberts is a graphic designer and organizer. Occupying the store-front like gallery of the CUE space, Roberts presents a bookshelf titled Design Within Reach, made from discarded materials from the Metropolitan Museum of Art (where she is employed) and featuring newly released issues of Oikos and Methods alongside Bittersweet, a commissioned natural scent by Tatiana Godoy Betancur, jewelry by Sarah Shikama, and ceramics by Lauren Francescone. Carolyn Salas' abstract sculptures are no doubt formal, but also suggestively human-scaled. Salas considers the physical installation of her works carefully, so they almost imply and build anthropomorphic conversations. Her most recent body of work utilizes the mold-making and casting process to create a sculptural installation on a large platform. Curator Rachel Reese is Associate Curator of Modern and Contemporary Art at Telfair Museums in Savannah, GA. She is a curator, arts writer, and independent publisher. Reese holds an MFA from City College New York, CUNY. 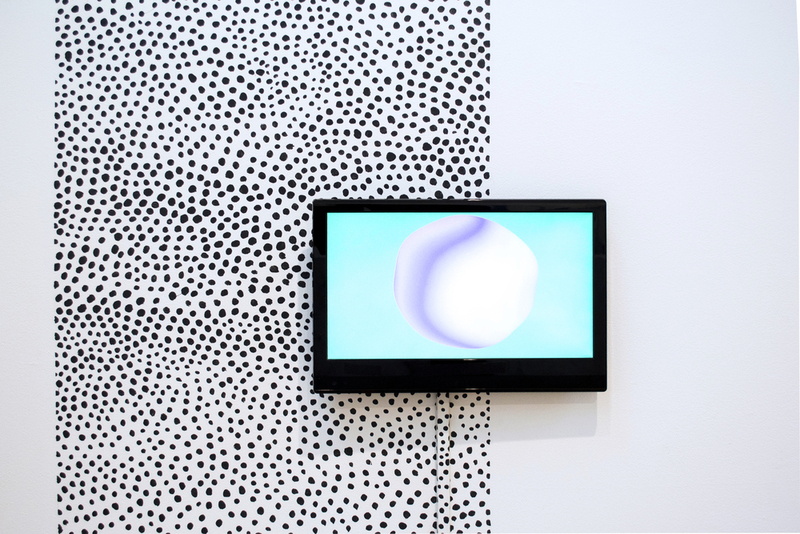 Reese has held positions at Atlanta Contemporary, Fleisher/Ollman Gallery in Philadelphia; Deitch Projects, Petzel Gallery and Andrew Kreps Gallery in New York. As an arts writer, Reese was the former editor of BURNAWAY Magazine in Atlanta, and her writing and artist interviews appear in BOMB Daily, Temporary Art Review, TWELV Magazine, and ART PAPERS, among others. She has taught Critical Issues art courses at PAFA in Philadelphia and Georgia State University in Atlanta. 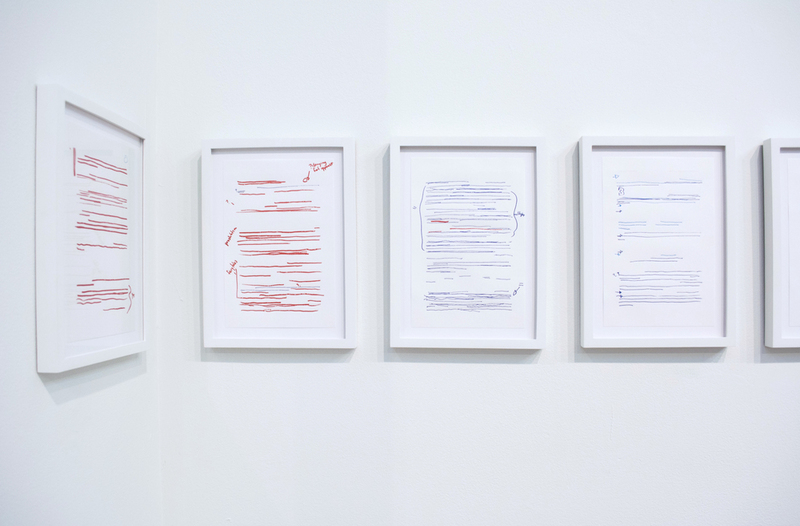 In 2009, Reese and her husband founded Possible Projects, a curatorial space in Brooklyn, and in 2010, Reese founded Possible Press, a free newsprint publication supporting artists’ writings and distributed internationally. In its five-year history, Possible Press has published writings from more than 115 artists. Reese lives with her family in Savannah, GA. 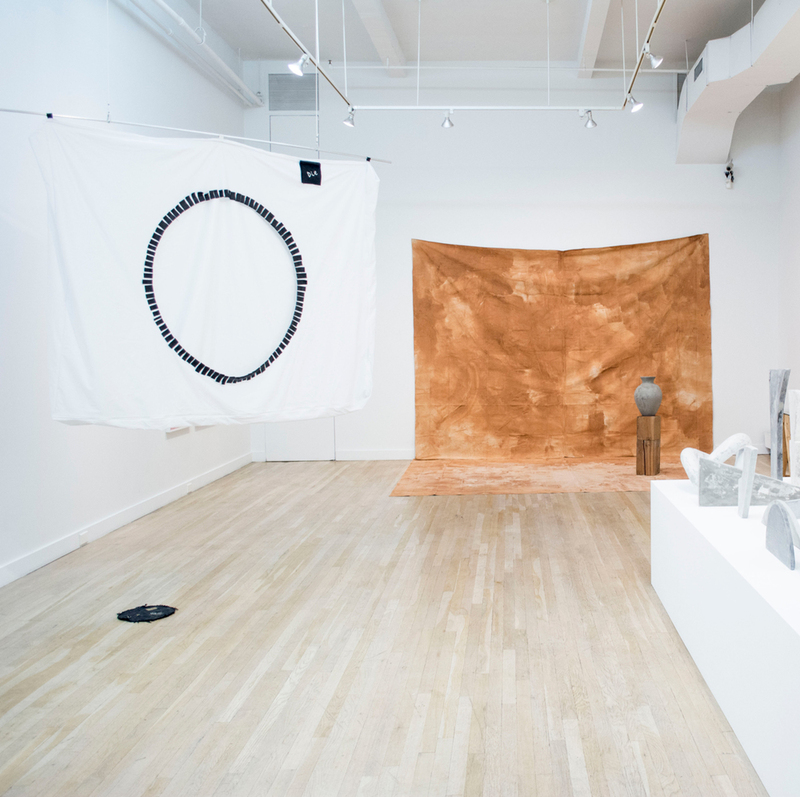 This exhibition is the winning selection from the 2015-16 Open Call for Curatorial Projects. This program provides one deserving curator the necessary time and resources to realize an innovative project, with the aim of encouraging curatorial research in tandem with exhibition planning. In line with CUE’s commitment to providing substantive professional development opportunities, panelists also serve as mentors to the curator, providing support throughout the process of developing the exhibition. Radical Plastic was unanimously selected by a jury comprised of panelists Cecilia Alemani, Donald R. Mullen, Jr. Director & Chief Curator of High Line Art; Renaud Proch, Executive Director of Independent Curators International (ICI); and Rujeko Hockley, Assistant Curator ofContemporary Art at the Brooklyn Museum.